" Vous etes Francaise? Vous etes Francaise? (Are you French? Are you French?)" a woman asked me as she was quickly walking towards me. I was thrilled and confused to hear someone speaking French, my native tongue, in a country where I was expected Spanish speakers and possibly some speaking English. I acquiesced, "yes I am French." It was barely three hours that I had arrived at La Havana, Cuba. She introduced herself. Her name: Berta. We started to chat. Berta said she had a nose to spot French visitors among the countless tourists who visit the island. My features reminded her of those of women she came across when she spent some time in France and Switzerland years ago. Berta is a former teacher of French at the Alliance Francaise at La Havana. Although she is no longer teaching, her French is irreproachable. As we starting to converse, she pointed at the bag of fruits she was carrying and complained of how much it has become hard to find food in Cuba. 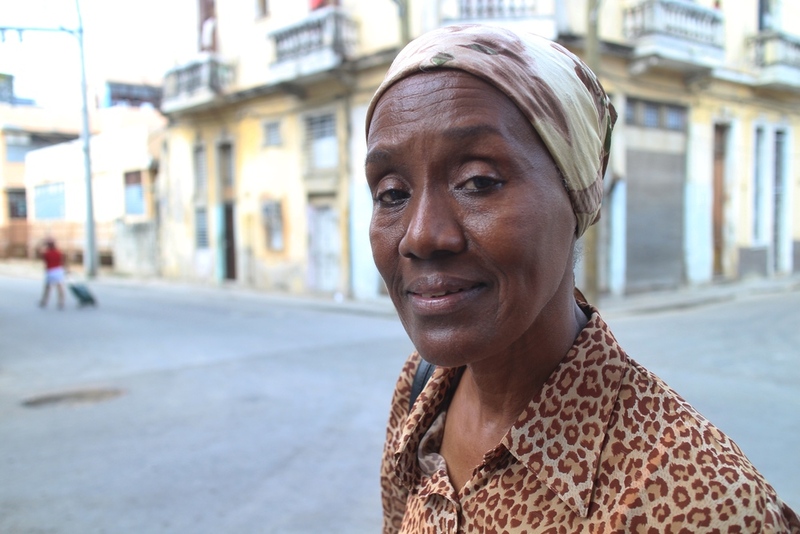 Finding affordable food for the average Cuban has become a daily struggle, she explained. She blamed the government for the starvation of many Cubans, including herself. Berta said she was jailed three times during her lifetime for fighting the socialist regime of Fidel Castro. She is convinced that every of her move is being watched. She has a son, Sammy, 40 years old, who still lives with her. "He cannot even get married because his bride would become a new enemy of the government," she said. Sammy, she said, also spent time in jail. "Here they target your family to weaken you," she explained. Berta never clearly stated what was the nature of her actions against the government for being arrested. She only explained that she has never been afraid of speaking against the regime which is not tolerated in Cuba. "Most Cubans have now accepted the situation and stay silent. It is like they are almost conditioned to live that life now," she added. Berta said she was once arrested in the 80s a few months after spending 13 months in Europe. She was in Switzerland where she had once a Swiss boyfriend. "They wanted to know the reasons of my traveling and for staying away for an extensive period of time," she said. Only an elite of Cubans are entitled to travel outside the country, she added. It was barely three hours that I touched down at La Havana that I found myself having a conversation about the Cuban regime with a strong-minded woman who was talking my native language. A woman who found out that I was French before even speaking a word with her. For a moment, I was taken back by what was happening. I wondered if by now I was myself being watched. My mind could hardly think clearly after 11 hours of traveling and barely no sleep for the last 36 hours. Berta handed me out a business card with her name and her son's name. It was a hand-written card. She had a few of them in her wallet. These prepared business cards were a proof of her intention to network and interact with whoever would listen to her and possibly get her story out. "Cubans will never change," Berta repeated many times with a tone mixed of exasperation and desperation. I naively asked her if the passing of power between the two Castro brothers, Fidel and Raul, brought some changes into the lives of Cubans. She laughed. "It is just a family business." Berta said she has even less hope of seeing any improvement happening for the Cubans now that the United States are normalizing its relationship with the regime. "By having relations with Cuban leaders, Obama is encouraging them in continuing the policies that they have implemented for decades," she said. "When socialism took over Cuba, I dreamt to see the U.S. invading our country to free us like they have done elsewhere," she said, adding "now it is hopeless." After about 20 minutes of conversing at the intersection of two streets in the middle of the afternoon, I let Berta go. She gave me a couple of the bananas she had just bought. I kindly accepted although I wished she kept them. Berta needed food more than I did.